Dual Core CPU/Processors. Core 2 CPU/Processors. Point of Sale. Tested for Full Functions, R2/Ready for Reuse. Generic Picture Used. Bare CPU/Processor only. Apple & Mac. Cables Connectors. 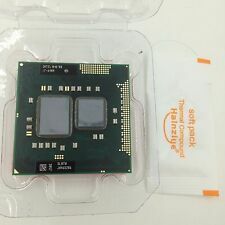 Processor Type Core i7 1st Gen. Socket Type Socket G1. Q: What Are The Warranty Details?. Then, place a new order for the item of your choice. MPN CP80617004152AE. The sale of this item may be subject to regulation by the U.S. Food and Drug Administration and state and local regulatory agencies. Our warranty does not include consumables, eg. Compatibility issues are not considered Dead On Arrival. 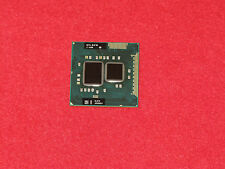 This i7 Laptop processor is tested and in good working condition. Compatible Socket. Product Specifications. None/Processor only. Cooling Components Included. Pulled from HP 8540w computers. Processor Model Core i7 640M. They are the best desktop processors on the planet. And you'll experience maximum performance for everything you do. Clock Speed 2.8 GHz. CPU Socket Type Socket G1. Processor Quantity 1. CP80617004152AE is an OEM/tray microprocessor. CP80617004152AE . Core stepping?. K0 (Q4C9, SLBTN). Part number Q4C9 SLBTN. CPUID 20655 (Q4C9, SLBTN). we specialize in computer accessories and so on. Model number: I7 640M. The number of CPU cores: 2. Processor Speed: 2.8GHz. Processor Socket: Socket G1 / rPGA988A. Application: Laptop. New Xiaomi Redmi Note 3 Pro Special Edition SE LCD Display Touch Screen Assembly. Stepping: SLBTN. Model number: I7 640M. L3 cache size (MB): 4 MB. The number of CPU cores: 2. Processor Speed: 2.8GHz. Processor Socket: Socket G1 / rPGA988A. For Samsung Galaxy Tab Active T360 LCD Display Touch Screen Digitizer Assembly. Model Number I7 640m. I7 640M CPU Processor X 1. Interface Type Socket G1. Socket Type Socket G1. CPU Frequency 2.8 GHz. Main Frequency 2.8GHz. Used in Great Condition !! We only Accept. ² 1 X i7 640M Processors. We will do our best and help you provide the solution. ETA 3 to 6 Weeks. For New Intel Core I7 640m SLBTN Dual Core 2.8GHz L3 4M Laptop CPU Processor. Stepping: SLBTN. Model number: I7 640M. L3 cache size (MB): 4 MB. The number of CPU cores: 2. Processor Speed: 2.8GHz. Processor Socket: Socket G1 / rPGA988A. Application: Laptop. We’ll promptly reply you. 2 cores, 4 threads, L2 cache: 2 x 256 KB, L3 cache: 4MB. Bus speed: 2.5 GT/s DMI, Clock multiplier: 21, Socket G1. CPU only (you need to heat grease and heatsink/fan to install). Fully tested in perfect working condition. Thermal Grizzly Kryonaut 1g Processor graphics card CPU GPU heat sink Cooling Cooler Thermal Grease composite grease silica. HALNZIYE HY410 HY510 HY610 HY710 HY810 HY880 CPU GPU processor Cooling Cooler Radiator Thermal Grease composite grease silica. ² 1 X i7 640M Processors. We will do our best and help you provide the solution. ETA 3 to 6 Weeks. ※ All faulty due to improper installation or improper use will NOT be covered by the warranty. 1 x 640M cpu. We will do our best and help you provide the solution. ETA 2 to 10 Weeks. Model Number: SLBTN. Processor Model： Core i7 640M. They are the best desktop processors on the planet. And you'll experience maximum performance for everything you do. CPU Socket Type： Socket G1. Socket Type: Socket G1. Stepping: SLBTN. Model number: I7 640M. L3 cache size (MB): 4 MB. The number of CPU cores: 2. Processor Speed: 2.8GHz. Processor Socket: Socket G1 / rPGA988A. Application: Laptop. New Mini USB Bluetooth Adapter V4.0 CSR Dual Mode Receiver Windows 10/8/7 /XP. Core stepping?. K0 (Q4C9, SLBTN). Part number Q4C9 SLBTN. CPUID 20655 (Q4C9, SLBTN). Type CPU / Microprocessor. CPU part number. 382 million transistors (CPU die). 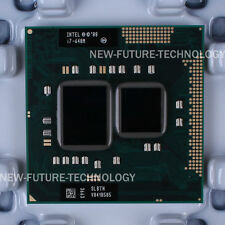 2 (CPU die). Part number Q4C9 SLBTN. Core stepping?. K0 (Q4C9, SLBTN). CPUID 20655 (Q4C9, SLBTN). Type CPU / Microprocessor. CPU part number. Processor core?. Floating Point Unit Integrated. Processor only, no accessories included. Other country. Asia countries. USA&Canada&Australia. United Kingdom. 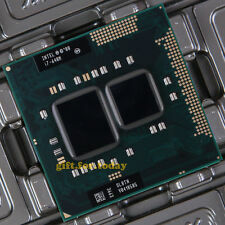 CPU Clock2.8 GHz. Processor Socket Socket G1 / rPGA988A. Processor only, no accessories included. Bus speed (MHz)2.5 GT/s. In 100% working order. Clock speed (GHz). Processor Type. Bus speed (MHz). After Sale. Slot type / BGA1288, PGA988. CPU series / Core i7 1 generation series. Applicable type / notebook. 64-bit processor / yes. Number of cores / dual core. Dual display compatible. Number of threads / four threads. L3 cache / 4MB. CPU series / Core i7 1 generation series. Applicable type / notebook. Core quantity / dual core. 64-bit processor / yes. Dual display compatible. Number of threads / four threads. Instruction Set / SSE4.1, SSE4.2. The Intel Core i7 640M is a dual-core mobile processor designed specifically for laptop and netbook computers. Based on the Westmere architecture, this processor has a base clock speed of 2.8 GHz and 4MB of L3 cache. You can buy new and pre-owned processors on eBay at affordable prices. Why should you buy a new processor? The Intel Core i7 640M is a low-cost processor that consumes relatively little energy. It is the first generation of Core i7 processors Intel ever released, and so the architecture and design represent a distinct break compared to previous types of processors. This allows you to get more processing power out of your aging hardware. The 640M contains Socket G1. If you are thinking about upgrading, then you should make sure that your motherboard is compatible with this socket. What are some features of the 640M? The 640M processors on eBay are equipped with several types of features to improve speed, efficiency, and security. Intel SpeedStep Technology: SpeedStep is a type of "dynamic frequency scaling" technology. It allows the processor's frequency to dynamically change based on the current requirements of the system. This is done to preserve battery life and lower power consumption on mobile devices. Hyper-threading: Hyper-threading allows a single core of the processor to perform work in parallel. This uses resources more efficiently that otherwise might be idle or underused. Turbo Boost: This technology raises the frequency beyond its normal level when particularly demanding tasks are running. Smart Cache: The cache is a small pool of memory embedded on the processor. Smart Cache technology makes it easier for the processor to share memory between different cores. XD Bit: This technology prevents the spread of malicious code that may try to take over another program's data storage area. How much power does the 640M consume? Power consumption is the result of something called the Thermal Design Power, or TDP for short. TDP is a measurement of the amount of heat that the computer's cooling system can reasonably dissipate under normally expected workloads. However, it does not measure the total amount of heat that the CPU can generate. The Intel Core i7 640M has a thermal design power of 35 watts. Does the 640M come with an integrated graphics processor? Yes, the 640M is equipped with an integrated "Ironlake" HD Graphics unit. Integrated means that it shares memory with the CPU. The base frequency of the GPU is 500 MHz. The turbo boosted frequency is 766 MHz.